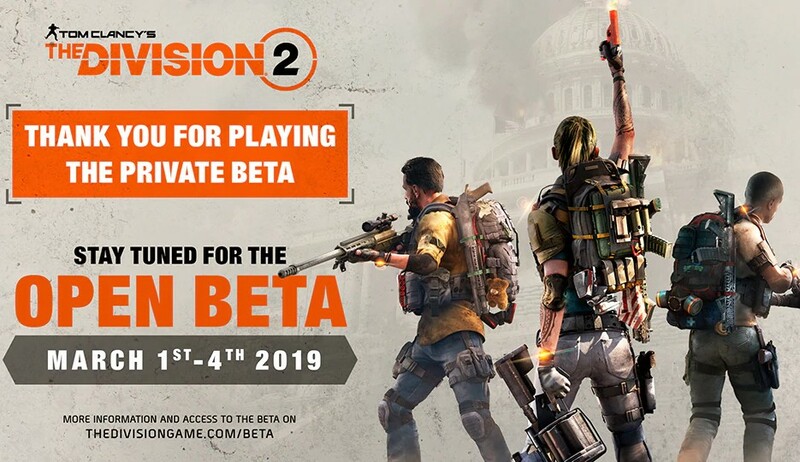 Those who missed the private beta stage of Ubisoft's upcoming title The Division 2 can join the open beta, which is scheduled to begin on March 1. Sadly, the open beta will only run for three days and the trial will end on March 4. The game will launch on March 15 on PC, Xbox One, and PlayStation 4. Tom Clancy's The Division 2 had a quick private beta run this past weekend, and Ubisoft has just announced the next step before the March 15 launch: an open beta stage that will kick off on March 1 and will last until March 4. However, most details concerning the upcoming test are still missing right now. The private beta delivered two main missions — Grand Washington Hotel and Jefferson Trade Center — and the open beta might not be that different. Obviously, at least some new side missions should be added to the new test. If you missed the game so far, here is a quick official description: "The Division 2 is the next evolution in the open-world online shooter RPG genre that the first game helped establish. Set seven months after a deadly virus was released in New York City, Tom Clancy's The Division 2 will bring players into a fractured and collapsing Washington D.C."
The players get to act as veteran Division agents who "are the last hope against the complete fall of society as enemy factions vie for control of the city." Sadly, the game involves a ridiculous amount of shooting, as you can see in the movie below. This game is definitely not a competitor to Arma or America's Army, but The Division 2 seems to be taking it all in the completely opposite direction a bit too much. The Division 2 is available for Xbox One and PlayStation 4 consoles, as well as Windows PCs. Were you a part of the private beta test? Will you join the open beta? Let us know what you think about Ubisoft's upcoming title in the comments section, but be sure to watch your language if you are one of those who already placed the "fail" sticker on The Division 2.